I am sure that many of you know that baker's twine is soooo in right now in the crafty world. There are a few manufacturer's that produce them, but today we are focusing on Divine Twine by Whisker Graphics. So let's cut to the chase and get to the bottom of it! -I love that their twine is thin and compact. With other baker's twine, it is a little too thick and can unravel quickly. -What great colors they come in!! So pretty. -It comes in spools. I love love love that! 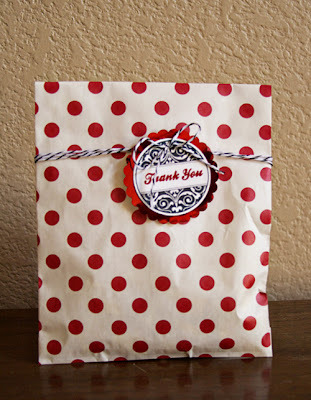 I have had some come wrapped around cards and that just makes the twine kink. Also I have had some come loose which is almost worse because it can become a knotted mess so easily. Technique inspired by Teri Anderson's card in July/August 2011 Paper Crafts issue on pg 53. Bottom Line: I love this twine! Truly. I have tried a few and this is my go to twine. Just so easy to work with and is the best quality I have seen! What do you think? Are you a baker's twine fan? Let us know! As for a giveaway, Whisker Graphics is giving away 2 spools of your choice!! FABULOUS!! Leave a comment by midnight EST on Tuesday to be entered to win! Look at that gorgeous twine all lined up in rows! Would love to win- baker's twine is such a great accent for papercrafting. Thanks for the chance! Yes,I like twine. I use twine on lots of my pages & cards. I'll even use plain old white string. Great projects! I am currently in LOVE with Baker's twine. I love baker's twine but never used this one. I would LOVE LOVE LOVE to have a whole spool to play and have fun with. That is a lot of twine!!! Thanks for the chance to win. I really need to give this stuff a try. I have only had a tiny amount that came in a kit to work with. I have a few sample sizes (yes wrapped around cards!) but haven't tried this brand yet. oh twine, how do I love thee? let me count the ways.... I have not had much in my hot little hands, and I have not tried Divine Twine, but I just know I would love it! Those pretty spools! I LOVE your cards. Thanks for sharing! I STILL have yet to try Twine. Thanks for the chance to win! I love twine... never have tried Divine Twine... it looks so pretty! I've bought baked goods just for the twine. :-) Thanks for the opportunity to win some! I have been dying to get my hands on some of the red and white twine. ROFL at your response to what you didn't like .. hee hee. This twine looks great, I do use twine -bought two small rolls from a company that I honestly can't remember, and they were sooo drastically faded - way different than what they showed online. So I'm happy to see someone has got it right :) Thanks for the chance to win! I have not jumped on the twine bandwagon, but I love the concept. Winning some free product would be fun! I LOVE twine! 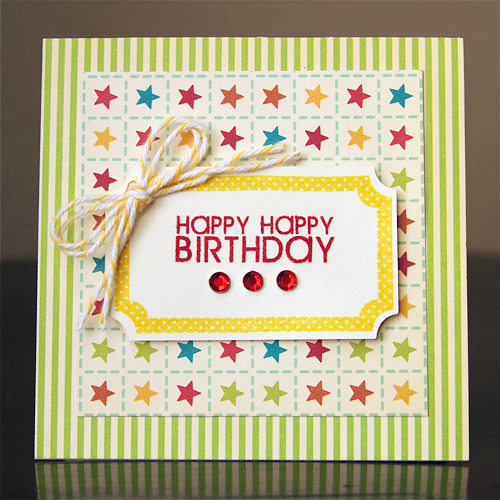 Kinda like gingham ribbon in that is adds such a cute punch of color and whimsy! So easy to use and so many yummy colors! Bakers twine is so fun! I reach for it often and wish i had a lot more! Love using twine on my LOs and would love to win some. Looks like there would be plenty on those cones to share with scrappy friends. I just love the look of twine on my LOs and Divine Twine is awesome! Oh my gosh! I love the look of baker's twine. I can't find ANY here locally and have been wanting some for the longest time! What a great win this would be! Baker's twine is so much fun! I love that these are less chunky - I should try them for hand stitching! I love baker's twine and Divine Twine especially. I've got their aqua & pink spools! 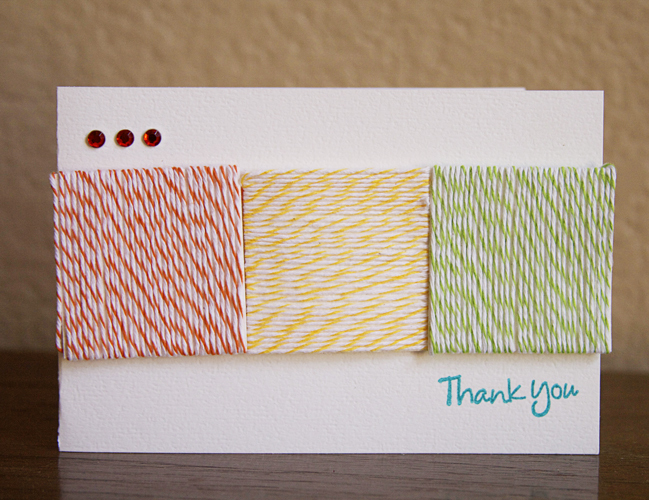 I love twine and your samples were adorable. I LURVE Divine Twine. It's simply the best! Love twine...I think I had a little bit of Divine Twine and I would love to win two spools...yippee! Your card with the 3 squares of twine wrapped around is awesome...they are all great creations! Love the twine! I love the versatility of it. I am such a fan of baker's twine. These look fabulous, I would love to craft with them. What a great review. Off to their website. I love twine! Love bakers twine...use it for all kinds of things...love what you did with it!!! Thank you for the chance to win! I, too, love baker's twine. Sweet stuff. I love you darling projects! I have some Divine Twine on its way to me right now so I'm excited to see such a great review. I like to use it on layouts, cards, and even to wrap packages. think it is a great idea that it comes on spools. I can never have enough twine!!! So cute! I had no idea that it came in so many pretty colors. I just recently got the brown sugar spool and love it. I use it on my pages and for all sorts of crafty things. Having 240 yards seems to increase its use as I have no fear at all of running out! I absolutely LOVE Baker's Twine! It can be used for so many wonderful things in so many wonderful ways! I like twine! This stuff sounds great! 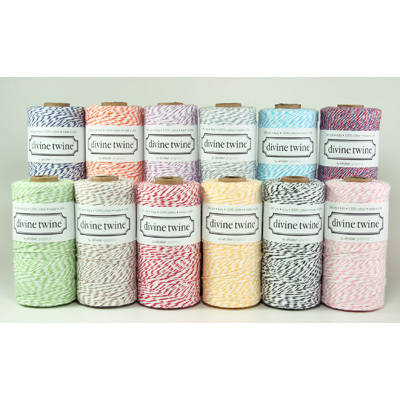 I love twine - love all the different colors that are available from Divine Twine - right now I only have basic red and blue. Definitely need more! Yum! Thanks for the giveaway! Gorgeous twine!!! Love it! Its so versatile, thanks for the chance! I've heard of Divine Twine but my LSS does not carry it. Would love to get some to begin my collection:-) TFS! I love baker's twine, but have never seen Divine Twine sold in our area. Love all the pretty colors!! Oh YES, I am a fan of baker's twine. I recently purchased a few different colors in small quantities (a little goes a long way!) I have never been able to get Divine Twine. From your review, it appears to be appropriately named! The colors are gorgeous. Thank you for the opportunity to win. Love the look of twine ... thanks for the chance to win! I love Divine Twine. I have some from an etsy seller and it is so fun to work with. I'm really hoping they are coming out with some new colours soon because I'm so disappointed when what I have doesn't match my project. I am a huge fan of baker's twine. I can never seem to feel complet without at least a bit of it on my projects. I would love to use some twine, but haven't purchased any yet. I pass up so many card challenges that require twine, because I still don't have any. On my list of "need". Thanks for the review and letting me know where I can purchase some. Gasp! I am so in love with those gorgeous twine colours!!!!! I really love the square card!!!! Thanks for the review. I would love to win some twine. You can never have enough embellishments. I have used twine and absolutely love it! Thanks for the chance to win a terrific product! I have seen twine on so many layouts and cards but have never been able to give it a try. It looks so fun to use, would love to win some! It would be divine to win 2 spools of this gorgeous twine! Oh, I just love this twine. I would love to have this added to my stash! Would I be giving away my age is I told you I remembered meat being tied with this! We use baker's twine with every package we send out! Love it! Oh I want some so badly, don't have any right now. Love your usage of them. Beautiful photo. Love all the colors. I've never tried this brand, just Martha Stewarts and Jillibean Soups, but everyone exclaims over this brand. Thanks for a chance to win some. love this stuff! the colors are so pretty! I have been a fan of bakers twine for years, so excited to see all the new colors! I am yet to have any divine twine and would love to get my hands on some!!! Big fan of bakers twine but I have not tried this brand. Would love to win. Thanks for the chance. I have a crazy love affair with Baker's Twine... shhhhhh don't tell my husband! I am a huge baker's twine fan and I would love to win. Thanks for this great opportunity! Love all the great colors! Would love to add some to my scrapbooking! I have yet to try this, but I seem to see it everywhere! I like the fact that it comes in so many great colors!! Thanks so much for the chance to win this!! I love the samples you made with the twine. I love the look of it on cards and scrapbook pages. Super cute cards! Would love to win a couple of spools! Love how versatile they are! I love baker's twine but haven't tried this brand yet. Would love to win. Thanks. I love using baker's twine. It's so much fun to play with. Thanks for the inspirations. Oh my - what amazing projects!!! Loving them ALL!! I have 2-3 spools of Divine Twine & adore them!!! There's just something about bakers twine - make me happy everytime! 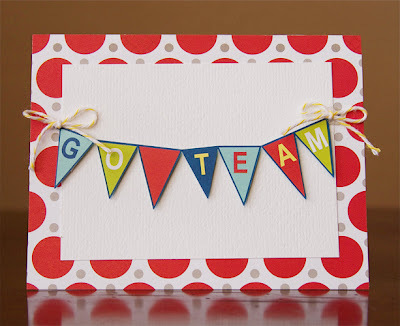 Love the cards and the twine! Great projects! I'm definitely a baker's twine fan! Thanks for the chance. Awesome projects! I love Divine Twine! Their colors are just fabulous!! I love twine! Thank you for the great review and chance to win! great colours! I've only seen red untill now. i saw this on the blog reader and coulnt get to the comment button. then i forgot to go back... i love twine,those colors are amazing!